The concepts of Heaven and the afterlife are often difficult for humans to wrap their minds around. Our limited visions of heaven are sometimes reduced, in popular culture, to cartoonish images of people playing harps on clouds. Teachings of The Church of Jesus Christ of Latter-day Saints (sometimes inadvertently called the Mormon Church) have been similarly reduced to cartoonish images of “godmakers” receiving their own planets. The doctrine of Jesus Christ is simple, but it’s not about planets—it’s about families. We are all literal spirit children of God, our Father in Heaven. As His offspring, we have inherited divine potential. Just as our children have the potential to become like us when they grow up, so do we have the potential to become as God is. To me, images of playing harps on a cloud or receiving a planet just seem…lonely. Heaven is having my family around—my husband, children, parents, siblings and even close friends. The Church of Jesus Christ teaches that this is what eternal life (or the ability to live in an exalted state, as families, in God’s presence) is all about. Many people wonder, “Where did we come from? Why are we here? Where are we going?” Our Eternal Father did not send us to earth on an aimless, meaningless journey. He provided for us a plan to follow. He is the author of that plan. It is designed for man’s progress and ultimate salvation and exaltation. God is the Father of our spirits. We are literally His children, and He loves us. We lived as spirit children of our Father in Heaven before we were born on this earth. We were not, however, like our Heavenly Father, nor could we ever become like Him and enjoy all the blessings that He enjoys without the experience of living in mortality with a physical body. God’s whole purpose—His work and His glory—is to enable each of us to enjoy all His blessings. (, 48). Jesus Christ, our Elder Brother, became the leader in advocating the plan designed by the Father, and we accepted the plan and its conditions. With that choice we earned the right to come to earth…. As literal spirit sons and daughters of Heavenly Father, each of us has divine potential—which can only be cultivated and refined in the test of life on earth. There are two purposes for life in mortality. The first is that we might gain experiences that we could not obtain in any other way. The second is to obtain tabernacles of flesh and bones. Both of these purposes are vital to the existence of man. We are now being tried and tested to see if we will do all the things the Lord has commanded us to do. These commandments are the principles and ordinances of the gospel, and they constitute the gospel of Jesus Christ. Every principle and ordinance has a bearing upon the whole purpose of our testing, which is to prepare us to return to our Heavenly Father and become more like Him. … Jesus Christ … is the centerpiece of the eternal plan of the Father, the Savior who was provided as a ransom for mankind. God sent His Beloved Son to overcome the Fall of Adam and Eve. He came to earth as our Savior and Redeemer. He overcame the obstacle of physical death for us by giving up His own life. When He died on the cross, His spirit became separated from His body. On the third day His spirit and His body were reunited eternally, never to be separated again. For Latter-day Saints, knowledge of our divine heritage influences our decisions, our values and, ultimately, our destiny. It helps us to focus our priorities so that we are headed in the direction we want to go—and avoid the distractions that would take us down other paths. Knowledge of God’s plan for His children gives Latter-day Saints a unique perspective on marriage and family. We are correctly known as a family-centered church. Our theology begins with heavenly parents, and our highest aspiration is to attain the fullness of eternal exaltation. We know this is possible only in a family relationship. We know that the marriage of a man and a woman is necessary for the accomplishment of God’s plan. Only this marriage will provide the approved setting for mortal birth and to prepare family members for eternal life. We look on marriage and the bearing and nurturing of children as part of God’s plan and a sacred duty of those given the opportunity to do so. We believe that the ultimate treasures on earth and in heaven are our children and our posterity. Surely we have learned by now, from the experience over centuries, that the basic family provides the most stable and secure foundation for society and is fundamental to the preparation of young people for their future responsibilities. We should have learned by now that alternate styles of family formations have not worked and never will work. Eternal life is the ability to live in an exalted state with our families. Not families created in the world’s way, but families created God’s way. If our goal is to become as God is, and have our own families throughout eternity, then we must understand how God defines the family. We learn this through ancient and modern prophets, as well as following the patterns God has set. The Family: A Proclamation to the World clearly defines this: Marriage between a man and a woman is ordained of God. 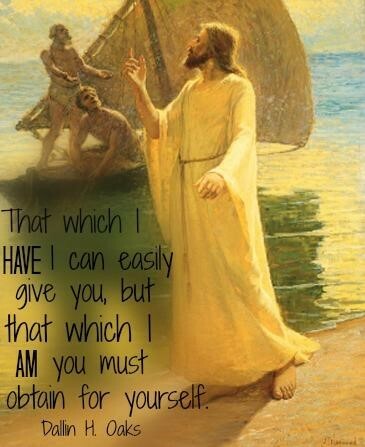 Members of The Church of Jesus Christ believe that we have the potential to become like our Father in Heaven and obtain all that He has—and this life is the test to see if we are willing to do so by obeying His commandments and following the Savior, Jesus Christ, in all things. The moments that we enjoy with those we love are all glimpses of what eternal life might be like. It is in the enjoyment of relationships that are refined and purified as we love and serve each other—and as we work together to serve others. Those are the glimpses into eternal life.